There is no shortage of guitarists who look to the past for inspiration. The field is cluttered with players who are good at mimicking their heroes, but never quite break through and capture the essence of what made them great. And then there is Reine Fiske who, while clearly rooted in the classic rock tradition, has plucked bits and pieces from his influences and developed his own voice. 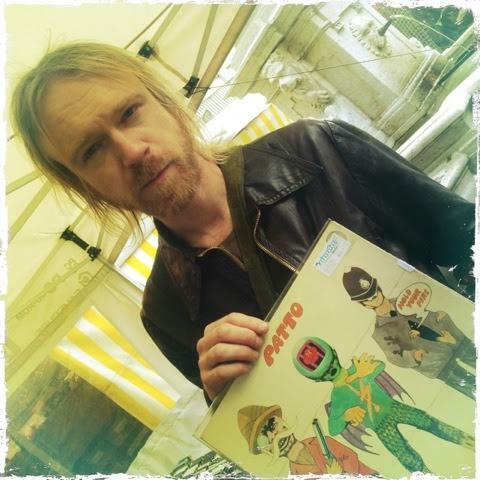 Best known for his work with Swedish genre benders Dungen, he can effortlessly move from jazz and folk to barn–burner rock runs that explode into a wall of noise, often all in a single song. This has landed him work as a co–producer and player on the soon–to–be released Bon Voyage by Melody’s Echo Chamber, as a session guitarist with Anna Järvinen, and kept him busy with other projects like The Amazing, Elephant9, and Motorpsycho, just to name a few. I met with him in a jazz club in Stockholm to discuss what prompted them to score The Adventures of Prince Achmed — one of the earliest animated films — and how one of the most inventive guitarists of his generation almost chose piano instead. Who was the first player that inspired you to pick up the guitar? I came from a musical family, but it wasn’t the guitar I wanted to pick up, actually. My grandfather was a really good accordion player. My mother plays the trumpet and some guitar. My stepfather was a good fingerpicker. When my mom met him, he was playing the banjo. He bought a 12–string, which was the first guitar I fiddled around with. The neck was really wide, and the string tension was crazy, so I wasn’t inspired. I was interested in playing the piano, not guitar. I just loved the sound when the sustain pedal was pressed down. Then I wanted to play the drums, but that wasn't practical — too loud! But my mother and stepfather were always singing songs at parties and things like that, so I knew I’d end up playing something. Did you learn on acoustic guitar? Yes, nylon string. Learning was stressful. Early on, I realized that I played better by ear than reading music, though I’m trying to get better at it now. It doesn’t matter when you decide to play rock music, though. You learn three chords and you can start a band. When did you cross over into electric guitar? What did you get? I got my first electric guitar when I was around 11. [It was] a terrible Hondo, but my mom bought me a cool Sony amp with two cassette decks so I could double–track myself. By 14, I was studying guitar, playing along with records, trying to figure out stuff. My parents could hear that I was really dedicated, and were very keen on me trying to find people to play with, but there weren’t people my age in my area of Stockholm that were into it. I love that your parents wanted you to get into a band. I started to play with these older guys who were temporarily missing their guitarist. They were like 20 years older than me but thought I was great. They were doing things like Santana covers and other classic rock. The next band I joined had members that were still a bit older than me, but only by five years. I met Stefan Dimle when I was in gymnasium [college preparatory school]. He had a record shop that was aimed more for collectors. He was into the '60s and '70s stuff that I already liked because of my uncle in Norway, who got me into early Genesis, Jethro Tull, Pink Floyd, some of the Moody Blues, but also the first Suzanne Vega record. 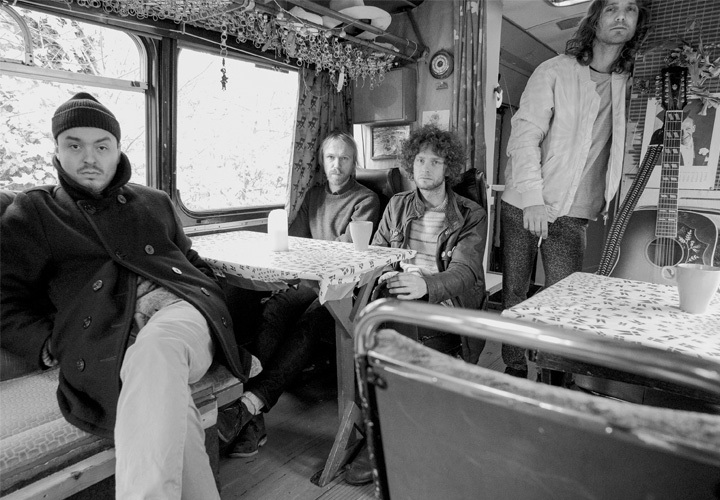 At what point did you and Gustav [Ejstes] meet, and how did you end up involved with Dungen? We met in 1998 in Gothenburg at an exhibition of '60s and '70s left–wing art. He was really into that and the music of that era. It didn’t take long for me to realize we had the same music genes. He had heard some music I was involved in and had checked me out on the internet as well, which was sort of weird. He approached me, and we talked for like three minutes. He asked me about the song that was playing. I was super stoned. That was the first time I met him. It took two more years for us to play music together, when we were brought together by Stefan Kéry of Subliminal Sounds [Dungen’s label]. The story is that Gustav was headed to an island in the south of Sweden to visit this girl that he was really fond of. He had made a recording around 1997 — demos of him playing everything himself. He was carrying a CD of that music that he'd burned for her. I can’t remember how, but he and Stefan ended up on the same train. Stefan had a record company and Gustav realized that he was connected to that style of music, so Gustav gave him the demo CD, instead of giving it to the girl. One night, after hanging out, drinking, and enjoying this amazing vibe going on, Stefan played me the CD. I just immediately thought, “This young guy, he is amazing.” Stefan said, "Wouldn’t it be a great idea if you hooked up and tried to do something with him?" Stefan told Gustav, who then called and invited me down to record the first LP, which was a school project for him. Ta Det Lungt surprised a lot of people in the U.S. when it became a hit. What was it like to tour there on the strength of a record that was sung entirely in Swedish? I didn't really think that much about it because it's never been a band, actually. It's Gustav’s project. I understand and respect that, but it created some friction at first. By the time we were on that tour, the friction had worn off, and we were just playing. It felt like success, but I was also a little concerned that it was just hype, and it might not last. It seemed a bit unlikely that it was happening. It was weird to end up on [Late Night with Conan O’Brien], too. Elephant9 seems like a natural, proggy fit for you, but in The Amazing you seem to be exploring a different style. The Amazing was more like… It's a ridiculous name to start with, but it's more like a fun band, as odd as that sounds. It turned into a friendship. Of course we thought it would nice to have some success but it wasn’t something we aimed for. Some of those songs have, like, three million Spotify hits, though. Christoffer [Gunrup] is such a special guy and a gifted songwriter. We share some of the same influences, but it's still such a different kind of project. We just like to work together. It's always been more like a band of friends who drink together, to be frank with you. We don’t have enough time these days, though. I’d like it if we could turn it into a more professional thing one day. How did Häxan come together? 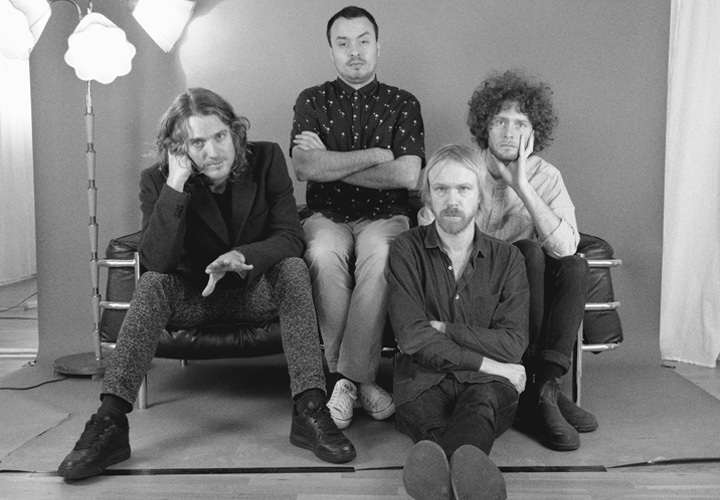 Fans who follow Dungen were surprised when it came out. Someone from the Film Institute in Stockholm contacted us to ask if we were interested in making music for the Sounds Of Silence Festival. We said yes, but there were only like four films left to choose from. We chose The Adventures of Prince Achmed, which is a beautifully made fairy tale, and the option we felt the strongest connection with. A month before the festival, Matthias [Gustavsson, Dungen’s bass player] and I met one day and said, “Okay, we have to get to work.” We started from scratch. I just had a little line, and Mattias had a little thing. Then Johan [Holmegard, Dungen’s drummer] joined us. Gustav came in last, and had the three strongest themes. We wanted the music to work with the film and not be a distraction. The album had to be cut down to 40 minutes. I like how the score works in its entirety, which is almost a half hour longer. 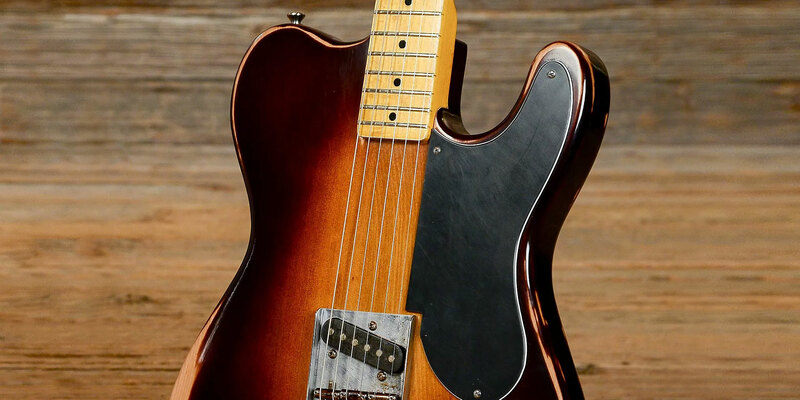 What is the story behind your parts Strat? I got it in August 1993. It has some parts from my previous guitar, which was a '62 Sunburst that I bought in 1990, and I should have left alone. It was quite a lot of money, but it was before they got really expensive. Now it's just crazy. But it was still a Sunburst, which sold for less than a custom color one. It was very beat up, and had jumbo frets. Someone had brought it here from the U.S. Every time I played that guitar, I had to wash the brown from my hands. It was coated with layers of filth from years of cigarettes and playing in bars. Amazing instrument. I decided to quit with it. I don't know why. The guy who bought it was honest and really cared for me. So he gave me a little money and this parts guitar he put together from a refinished '63 body and a '64 neck. I could keep the plastic parts from the ‘62. I really love it, though it’s just getting more and more beat up. Reine's Marshall and Strat on the road. There’s no decal on the headstock because it’s been repaired. I threw it through the floor, just out of total frustration, and it cracked. Sometimes I get into these fits that I can't control. I get totally crazy. I’ve never hit anyone in my entire life, but I have trashed some stuff. Kicked amps over and threw guitars through the floor. It's because I just can't get stuff out that I want to get out of me, but maybe it's because of the energy of the music as well. So it's been glued, and it works. It has cracked again, more times, when it was put in checked baggage. I just told the last repair person to mend it again, but put zip ties on it because it's going to happen again. That’s why I’ve never bothered to put another decal on it. You can't get these from any factory, and that's the beauty of them. These hybrids caught our eye, whether inspired or insane. What drew you to the Strat in the first place? Basically because all of my favorite guitar players played one. Jimi Hendrix, David Gilmour, Hank Marvin, Mark Knopfler. They all played a Strat. I would like to have another guitar, but I never seem to find the right one. I’d love to have a Rickenbacker six–string — especially an old one — but they're so expensive. It’s Peter Banks’ sound in Yes, which was incredible. What is your typical signal chain? I don’t use too many effects, but it's always the same chain. I plug my guitar right into a Boss tuner, which I’ve heard you shouldn’t do, then it goes into my most treasured pedal. It is the best–sounding and also the worst pedal to tame: the Carlin Compressor Fuzz. When it works, it's the best pedal ever. Then into a Cry Baby wah–wah pedal, whatever kind of fuzz I'm into at the moment, and then maybe an Octavia. I've been using either a Vox AC50 or a Marshall 50 watt. I need reverb, though. I've been trying to find a reverb pedal that I like, but I’m not having any luck. Then everything goes into the Klemt Echolette tape echo. Have you ever used a reverb tank? Yes, but it didn’t stick because they can be noisy and can break on the road. I mean, a Fender Super Reverb in the right room is the ultimate amp sound. But when you play a bigger place, the sound disappears. I played a Twin for many years, and a Vox AC30 as well, but that was before Dungen. So with Dungen, I just got this Marshall 50–watt head. It’s a '72 Super Bass Lead 100–watt with two power tubes pulled, [to drop it to 50 watts]. I need to get a Power Break though. It’s a better way to accomplish that because it retains the proper voicing. That goes into a Marshall 4x12 most of the time. You rely on echo so much. What happens when a vintage tape echo goes down? I have spare tapes with me, but one time the Echolette failed, and it was chaos! It happened in Australia. There was something really wrong with it, and it shut down the whole PA system. It was crazy. So I've been using the Roland RE–20 as a back up. It’s very different but it will work in an emergency. Gustav uses it for the piano. What is the most inspirational piece of gear you've ever bought or acquired? The Klemt Echolette. I bought it because Kenny Håkansson — my favorite guitar player of all time, who also played a Strat — used one. He played with Bo Hansson. Also Kebnekasje, whose first record is very different from the others, but it's one of the best hard rock albums ever made. 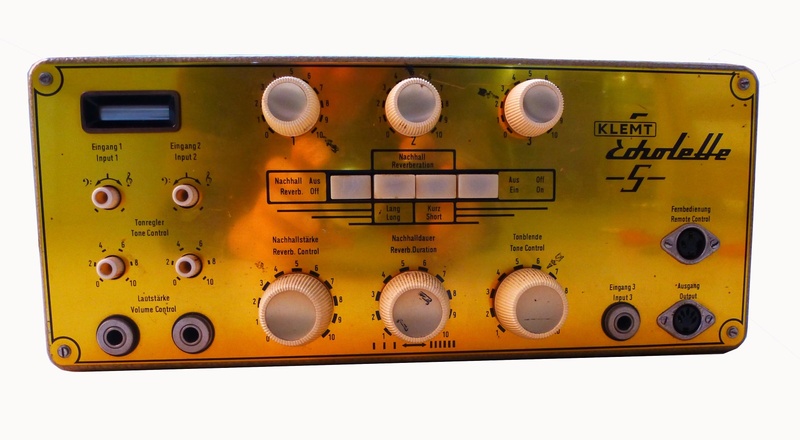 Anyway, the Klemt is always on, because it has such an amazing preamp. The wet/dry mix is usually at half. I had used other tape echoes before it. The guy who now builds the digital Mellotron, Markus, put extra heads in a Roland RE–201 just to make it even more like a Vox Long Tom echo, which was used by Hank Marvin. Those are just so rare, it's ridiculous. Binson Echorecs are too fragile, rare, and expensive to keep up. They are great, but mine sounded awful because it was broken. When they work, they're amazing, but they produce a special kind of echo that’s not exactly what I'm looking for. I was looking for Kenny's sound, which can't be created with a Binson. I found my Klemt in a store one day, just sitting there. There was a live picture of Kenny with a gold box sitting on a Marshall stack. Then I looked at the Klemt in the shop… same box. “Oh, that's the thing!” I plugged in a guitar, started to fiddle around, and there it was. “Oh! Here’s the sound!” So I bought it right then. You can still find them at a decent price. I decided I really needed spare, because it’s the most important part of my sound, so I just bought one in mint condition online from Germany. The owner’s mother and father were in a Schlager band. It had just been sitting in a case in the basement. It’s a double case with legs that’s meant to house both the Klemt M-40 amp and the tape echo. He checked me out on the internet and realized, “Wow, you’ll actually use this tape echo!” Because it's old and hasn't been used for so long, it needs a little maintenance. But he sent me the case with the legs for free, just so I could have it, which is so nice because I already have an M–40. Of course, the Carlin Compressor Fuzz is the other. It's still a loan from a friend. It was just sitting in a drawer. He wasn't using it. I have a clone of it but it’s not quite the same. 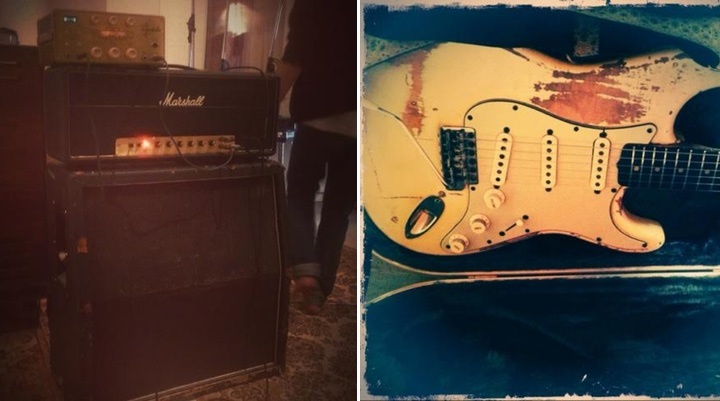 When I was working with Kevin [Parker, of Tame Impala], he had bought this replica of an old Supro amp. I didn't like it very much, but when I plugged in that clone, something happened. It was such an amazing fuzz sound with that amp, so I’m giving it to him.